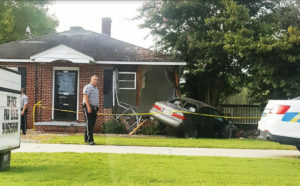 Selma Police believe a medical condition may have caused a woman to lose control of her car before it crashed into a building on S. Pollock Street (US 301). Police said the 34 year-old Selma woman was leaving the Marathon Gas Station at 905 S. Pollock Street at 7:41am Wednesday and appeared to be headed south when her car crossed through the center lane then into the northbound lanes before leaving the roadway and striking a building at 1011 S. Pollock Street. Altogether, police believe the car traveled 154 feet without the driver being in control of her vehicle. The driver said she remembered leaving the gas station then being hit in the face by an air bag on her 2000 Toyota. Johnston County EMS transported the driver, the only occupant in the car, to Johnston Medical Center where she was admitted for treatment. Police believe the driver suffered a medical issue causing her to black out before the crash. Damage to the building, owned by Stancil Family LLC, was estimated at $20,000. Damage to the Toyota was estimated at $2,000. No other vehicles were involved. No charges were filed.